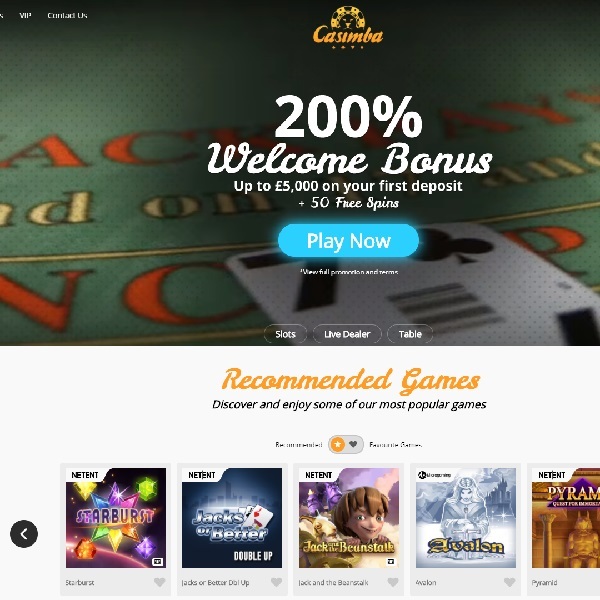 Head into a jungle of online gambling at the new Casimba Casino and you can enjoy hundreds of top games and some huge bonuses. The casino is welcoming new players with a 200% first deposit bonus of up to £5,000 together with 50 free spins. There is a 50% second deposit of up to £1,000 with 50 free spins and a 75% third deposit bonus of up to £500 with 25 free spins. The casino has been licensed in the United Kingdom so you can be sure it is trustworthy and it offers customer support via live chat and email. At the casino itself you will find games from a huge number of developers such as Net Entertainment, Microgaming, 1x2gaming, Merkur Gaming, BGT, ELK Studios and many more. There is a huge collection of slots to enjoy, plenty of card and table games, live dealer games, arcade games, scratch cards and more.